JHS: I am not kid-friendly. 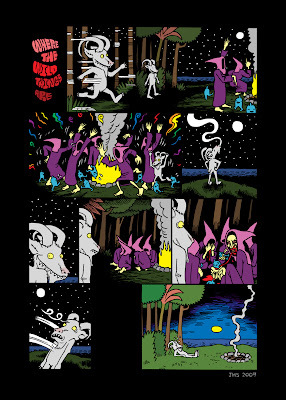 For the up-coming Where the Wild Things Are movie, Vice magazine put together a promotional comic book edited by Johnny Ryan. (The mini website is here; I think the pamphlet will be included in this month's magazine.) The "night-time" strip above was my original submission. It was rejected at the last minute by Warner Bros. Here is the soft, lite, "day-time" strip that they did accept. I like both, but the night time one is awesome. I really like the night version. Nice work Sir! By the way, when do you think the next Jessica Farm book will come out? J. Farm Vol. 2 will be out in 2016! Darn it, that's right, you're drawing a page per month. Rejected at the last minute? It's really good for what it is, but for a promotional piece for a kids film Im surprise they even considered it! I agree, I'm surprised it got as far as it did. It wasn't upsetting, just stressful having to bust nuts to get the PG one done the next day.